Named after the man who met the challenge of putting a dome on the city’s enormous Santa Maria del Fiore cathedral, Hotel Brunelleschi is a coveted property within the Renaissance city. Located two blocks from the Duomo, next to which a statue of the namesake architect Filippo Brunelleschi stands, this Florence boutique hotel is housed within a circular Byzantine tower from the 6th Century and a medieval church. The 96 guest rooms are luxuriously outfitted, and some of them offer spectacular views of the Duomo, the bell tower, and all of Florence. 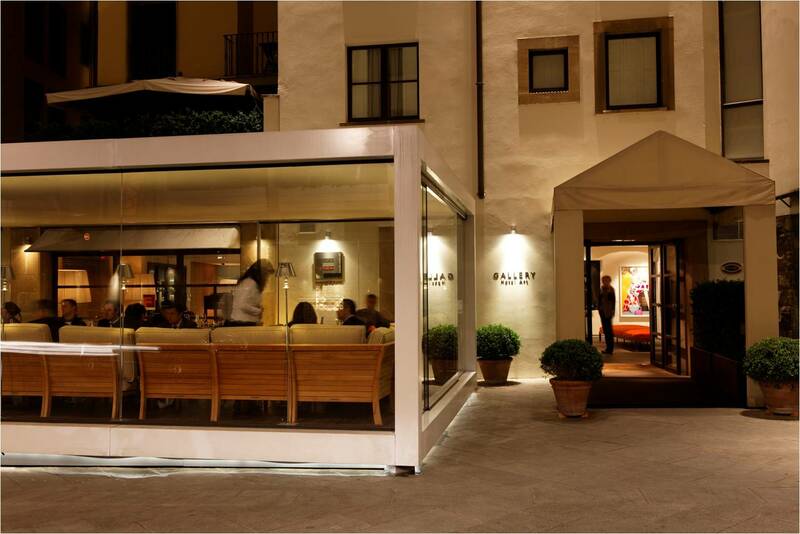 Enjoy a meal at one of the hotel’s two eateries, Santa Elisabetta Restaurant and Osteria della Pagliazza. The former has a 4-star menu prepared by Chef Giuseppe Bonadonna, while the later is a bit more casual, offering traditional Tuscan dishes. And the on-site private museum is pretty cool too. Each window in this spectacular room offers a different postcard-worthy view of Florence. With a 360-degree panorama, you’ll be able to bask in the glory of the Duomo, its cupola, and bell tower, plus the dome of San Lorenzo, the impressive spires of Santa Croce, the iconic stone clock tower of Palazzo Vecchio, and the hills of the surrounding region. 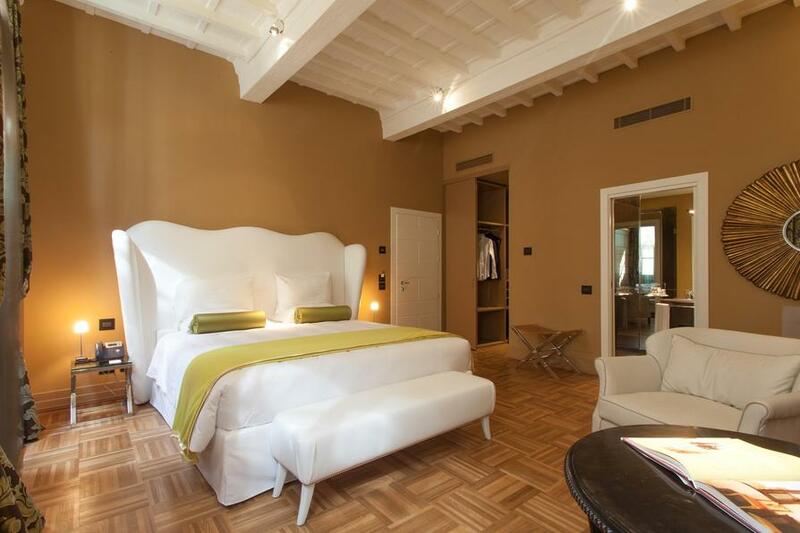 In the room, enjoy a large circular bed, oak parquet flooring, and a large marble bathroom. Contemporary design, lush velvet headboards, floor-to-ceiling drapery, and sleek lines offer a glorious contrast with the historic views outside the window. Some of these rooms feature views of the Duomo and its bell tower, while others face the bustling street Via dei Calzaiuoli, home to the best shopping in Florence. Choose from two twin beds, which can be joined together, or a king-sized bed. Pair two Deluxe rooms together to accommodate up to six people. Great for groups and families. Quiet and spacious, this double room overlooks the hotel’s inner courtyard. Features include a four-poster bed, a walk-in closet, oak parquet floors, a large bathroom, and contemporary design. Choose from a view of the quiet Piazza Giglio or the lively Via dei Calzaiuoli, plus either two twin beds or a queen size for a modern stay in Florence near the city’s best shopping. Part of the Hotel Brunelleschi family, this Florence B&B offers a more rustic stay with views of the Duomo and proximity to the city’s famous shopping and museums. Modern luxury in 432 square feet, the Junior Suite features either a four-poster bed or two twin mattresses, plus parquet flooring and a large wardrobe. The oversized marble bathroom features double sinks and a whirlpool tub. With a sitting area that overlooks Piazza della Repubblica and its charming carousel, this luxury suite measures 410 square feet and houses a king-sized four-poster bed, plus a large bathroom. Your living room window will perfectly frame one of the most iconic architectural features in Florence: the tower of Palazzo Vecchio. Overlooking Via del Corso, the One-bedroom Suite offers nearly 500 square feet of living space, plus a separate bedroom with king-sized mattress, a walk-in closet, oak floors, and a marble bathroom with whirlpool tub. Enjoy a welcome basket full of local wine, fruit, and sweets. Join together two suites for massive amounts of space overlooking either Via del Corso or Piazza Giglio. Take in the towers of Florence with the Bargello Suite and its views over Santa Croce and the museum after which the room is named. Enjoy 484 square feet of living and sleeping spaces, plus a marble bathroom featuring both a whirlpool tub and a separate multisensory shower. Settle in with a welcome gift that includes, wine, sweets, and fruit. 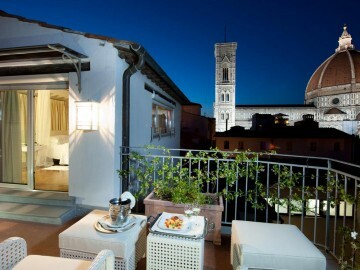 A suite that overlooks the most famous view in Florence: the Duomo. Enjoy 484 square feet of space, a king-sized four-poster bed, a walk-in closet, and a marble bathroom with a whirlpool tub. Your room also comes with a welcome give such as fruit, sweets, and a bottle of local wine. 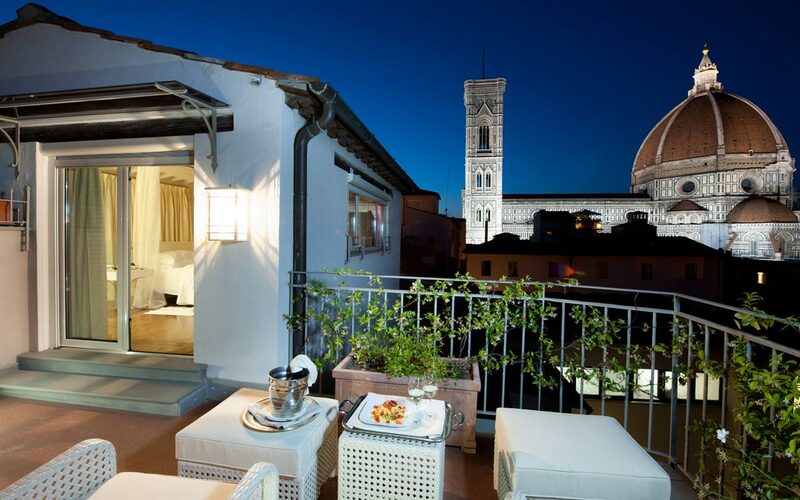 Enjoy viewing the city from your hidden perch above the rooftops at this boutique hotel in Florence. Your own private balcony is the perfect place to have breakfast while taking in the view of Palazzo Vecchio. 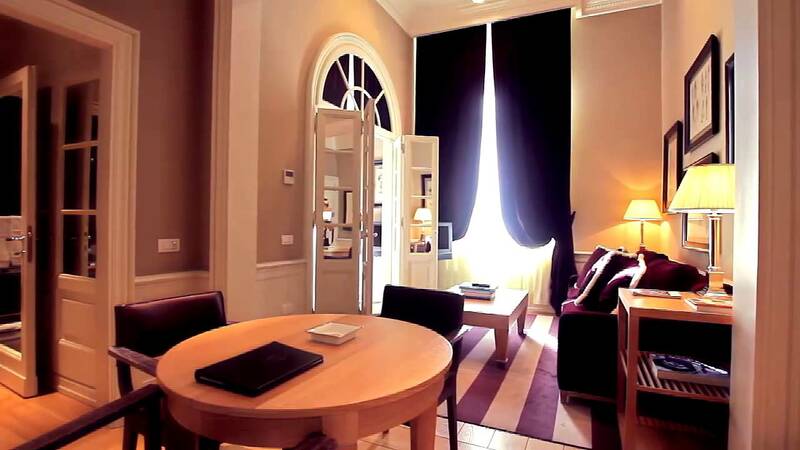 On the other side of the suite, catch a glimpse of the Duomo and its bell tower. In-room furnishings include a king-sized canopy bed, a plush sitting area, and a large marble bathroom with a Jacuzzi tub. For an unforgettable stay, this bi-level suite boasts a private terrace offering a nearly 360-degree view of Renaissance Florence. Relax in the outdoor hot tub while taking in the views of the Duomo, Palazzo Vecchio, and Santa Croce. The terrace is just off of the corner bedroom, which features a canopy king-sized bed, wood-beam ceilings, and double views of the Duomo. On the first floor, you’ll find a living room and an enormous bathroom with a Jacuzzi big enough for two. Ancient quarters outfitted with the most luxurious modern luxuries, a stay in the Pagliazza Tower Suite puts you in the oldest building in Florence, built between 541 and 544 by the Byzantines. And the original details are what lend unforgettable charm: stone walls, oak floors, and golden chandeliers. Contrasted with modern furnishings designed especially for this circular room, you’ll also enjoy a round bed, views of the Duomo through tall arched windows, and wood-beam ceilings. Join the Bargello Suite, the Duomo Suite, and the Deluxe Executive Panorama room for never-ending views of Florence, plenty of space, and all of the amenities you could ever need during your holiday in Tuscany. Positioned in the busiest thoroughfare in downtown Florence. 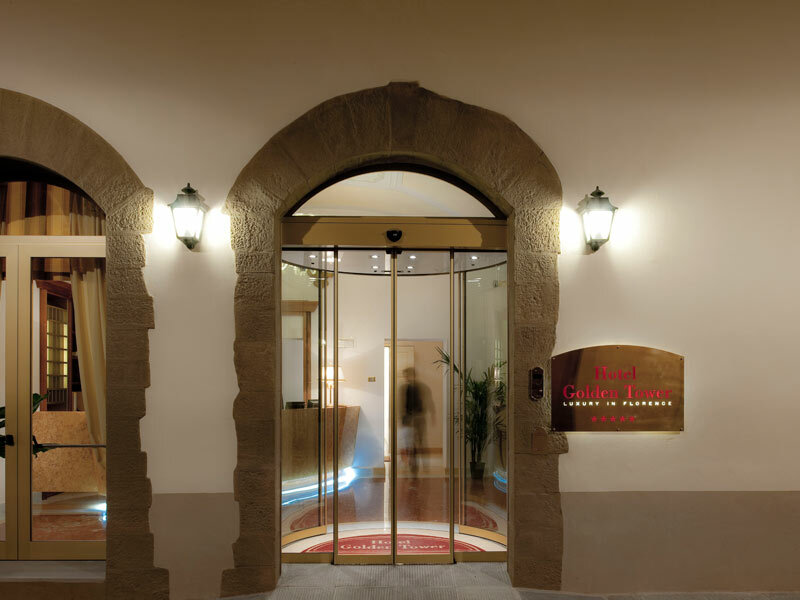 Two blocks from the Duomo, two blocks from Piazza della Repubblica, and at the intersection of two of the city’s best shopping streets, Via del Corso and Via dei Calzaiuoli, Brunelleschi Hotel is also steps from the Dante Alighieri house. The best choice for those who want to take advantage of all that the cradle of the Renaissance has to offer. Children under 2-years old stay for free in a crib; an older child or an additional adult charged additional fee. Pets allowed on request for no additional fee.